White sandy beaches, pristine clear waters and lush tropical rainforests are what make Hainan Island a true paradise and perfect destination. Hainan Island is the smallest of the Chinese provinces and located in the South China Sea. 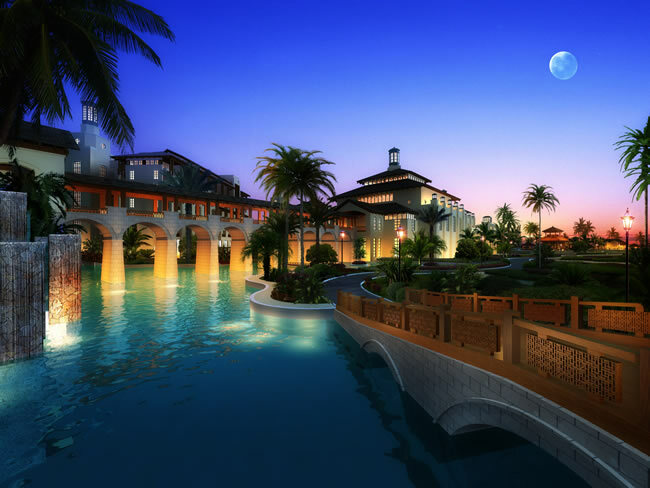 On Jan 8th, 2012, Kempinski is proud to open the Kempinski Hotel Haitang Bay, only 25 minutes from Sanya Phoenix International Airport. The property is set to become a stunning Chinese hideaway alive with European flair. The five-star hotel is made up of four interlinking parts – the hotel complex, private villas, a conference centre with several meeting rooms and a leisure part, which offers a golf course and a luxurious spa. A 1,200 meter long sea water river connects the different parts of the premises and taking the gondola between the guest rooms and restaurants is a romantic and not to missed experience. The conference centre offers eleven meeting rooms for any conferences and meeting needs. The Grand Ballroom can host large events up to 1,200 guests. The spacious outdoor venue – a beautiful lawn, leading to a pristine sandy beach – is the ideal setting for beautiful weddings, birthday parties, gala dinners, anniversaries, celebrations and exhibitions. Executive Chef Nikolaos Lekkas and his team will present delicious culinary creations in six outlets, with Café Berlin offering international buffets, the elegant Yuen Court Chinese Restaurant in modern design with the river floating through the restaurant will serve Cantonese cuisine and Hainan specialties. The El Faro Beach Bar invites guests to linger and relax, snacking and enjoying cocktails whilst taking in spectacular sunsets. At the world-renowned Paulaner Bräuhaus, guests can enjoy freshly home-brewed beer and hearty Bavarian dishes, being entertained by the live band! The Rotunda Café is located at the heart of the hotel complex. A la carte lunch and dinner feature the best of Chinese, Asian and Western cuisines. Crunchy snacks and soft sponge cakes are displayed alongside fine desserts, tempting guests to linger for an afternoon tea served by a tea specialist at the Rendez-vous Lobby Lounge. The Art Centre, spectacularly located, surrounded by the river and golf has been built brick by brick from an old Shanghai-style house previously owned by Mr. Du Yue Sheng (20th century Chinese celebrity). The 9-hole practice golf course includes a children’s putting green, and blends perfectly into the picturesque garden. The Spa Centre will pamper you, relax and make you feel rejuvenated. Exclusive shopping, two well-lit tennis courts, outdoor swimming pools, fitness centre, games room and many other recreational facilities complete the menu offering.